In a superheated liquid, bubbles start to form on nucleation centres - surface irregularities, dirt or positive ions - in the liquid. Bubbles can therefore form along the track of a charged particle, and make it visible. This was the principle exploited by Glaser in 1952 in the first bubble chamber, which proved of great importance in particle physics experiments for many years. 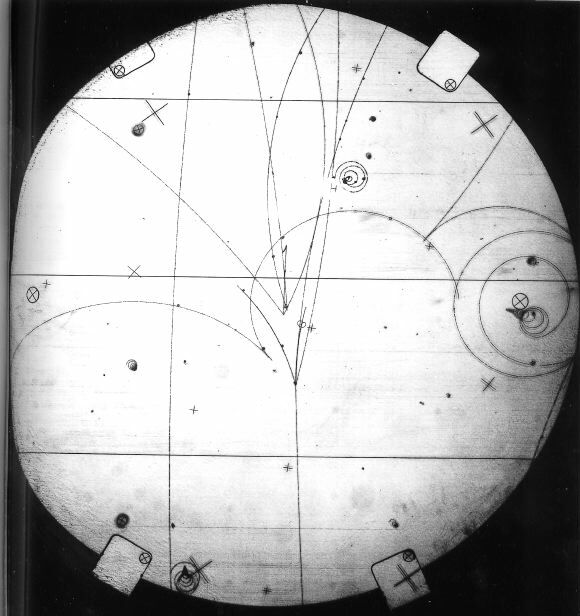 A typical bubble chamber is filled with liquid hydrogen (forming a very simple nuclear target) at a temperature above the normal boiling point but held under a pressure of about 10 atmospheres by a large piston to prevent boiling. When particles have passed, and possibly interacted in the chamber, the piston is moved to reduce the pressure, allowing bubbles to develop along particle tracks. After about 3 milliseconds have elapsed for bubbles to grow, the tracks are photographed using flash photography. Several cameras provide stereo views of the tracks. The piston is then moved back to recompress the liquid and collapse the bubbles before boiling can occur. At low momentum, it is dominated by multiple Coulomb scattering as the particle passes through the dense liquid. Holographic recording of the bubble chamber can lead to a resolution as good as 6 microns in small chambers (used for studying very short-lived particles such as B-mesons). Other liquids can also be used, to provide an alternative target. E.g. if deuterium is used, interactions with both protons and neutrons are possible. Additional external detectors can be used to trigger the flash and film advance, to select particular types of events. Film measurement and event reconstruction is slow, even with semi-automatic measuring machines (such as Sweepniks, spiral readers, etc.). The sensitive period is quite long, so the beam intensity must be limited. Though the camera can be triggered, the chamber itself cannot. A typical cycling rate is about 10 Hz or less (though it can be faster for very small chambers), normally matched to the pulsed beam extraction rate from the accelerator. For the above reasons, it is difficult to search for and study very rare events. The liquid in the chamber acts as both target and detector, so bubble chambers cannot be used with modern colliding-beam machines. Picture from the Stanford 1 m hydrogen bubble chamber, exposed to 8.8 GeV/c antiprotons. (external particle detectors were used to identify the charged kaon).